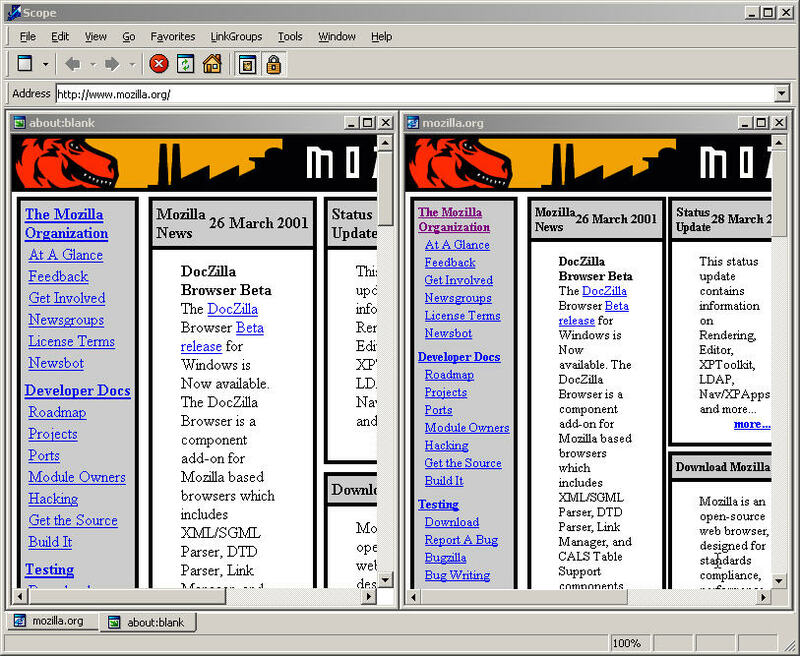 Scope is a multi-tabbed browser which displays web pages using either the IE or Mozilla engine - or both if you want to compare pages side by side. 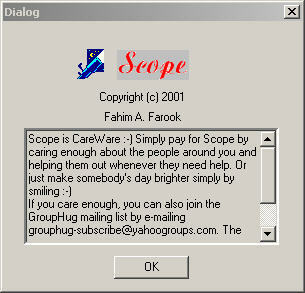 In addition to being extremely fast, Scope is very, very lightweight - only about 250k for the whole program! LinkGroups which allow you to save a set of open browser sessions and re-open them later simply as a menu selection - much like your Favorites. Easy access to your IE Favorites and the ability to modify them from within Scope itself. The ability to save the last pages you were viewing and reopen them when Scope is next run. The ability to start Scope with many different options including a LinkGroup, your own URL (not IE home page), last viewed sites etc. The ability to have the tab bar at the top of the screen or the bottom of the screen. The option to have a single line tab bar (with scroll arrows when it gets too large to fit in one screen) or a multiline tab bar. The address bar auto-completion is irritating. Yes it is :-) I can't figure out how to turn it off since it should be turned off if you turn of auto-completion in IE but I'm told even that doesn't work. The good thing is that you don't have to type in the www part if the address is in your history and if it isn't and it's a .com address, you can simply use CTRL+ENTER to add www. to the beginning and .com to the end without having to do any typing at all. 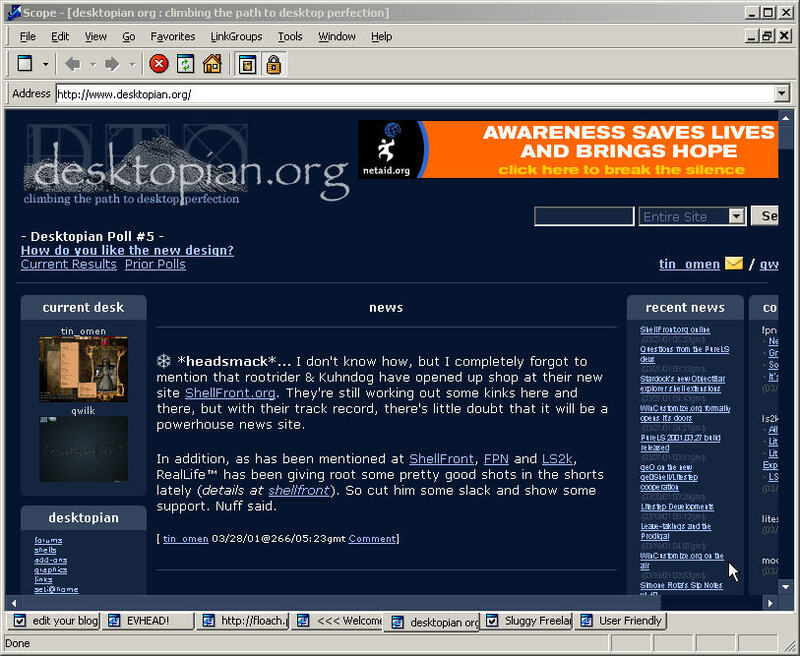 The positions of address bar, toolbar etc. cannot be saved. This is currently not supported but will be in a future release. "The SCOPE.EXE file is linked to missing export SHELL32.DLL:523" error message when trying to run Scope. This is due to having an older version of Shell32.dll not because Shell32.dll is missing. This problem usually occurs on older Win95 machines. 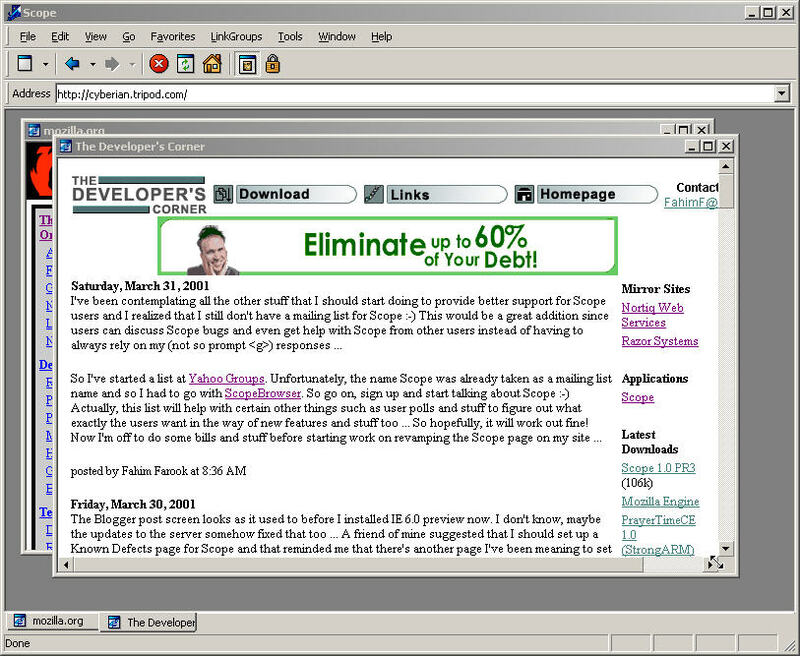 The current solution is to uninstall your version of IE (if it is 5.0+), install IE 4.0 SP2 with Active Desktop support, then reinstall your current version of IE (5.0 or 5.5). IE 5.0+ does not update system files when it is installed - hence the necessity for this roundabout solution.